The car park will be closed from 5pm Saturday 16th March until 5pm Sunday 17th March so that works to repaint the parking bays can be carried out. Please remember to remove your vehicle. At a meeting of Cambourne Parish Council on Tuesday 5th March 2019 Cambourne Parish Council voted to become Cambourne Town Council. To represent a Town of four villages (Great Cambourne, Lower Cambourne, Upper Cambourne and West Cambourne). This decision comes on the 20th Anniversary of the first resident moving into Cambourne. In June 2018 the House of Commons Library published a Briefing Paper Number 8322 City & Town Classification of Constituencies & Local Authorities. • Strengthens Cambourne’s Identity and gives an overall community identity linking the four Villages. • No cost implications to the residents. • The Council would be seen more positively within the County and surrounding Districts. • There aren’t any increased responsibilities by becoming a Town Council. • There is a genuine debate which could be had about the potential economic benefit of calling yourself a Town and strengthening partnership and business links to bring more opportunities to the town. • Assists in marketing of the shops on the High Street. Nearly all professionals that come to Cambourne to give presentations see Cambourne as a Town. Part of the problem in marketing Cambourne is that some larger companies won’t go into villages. 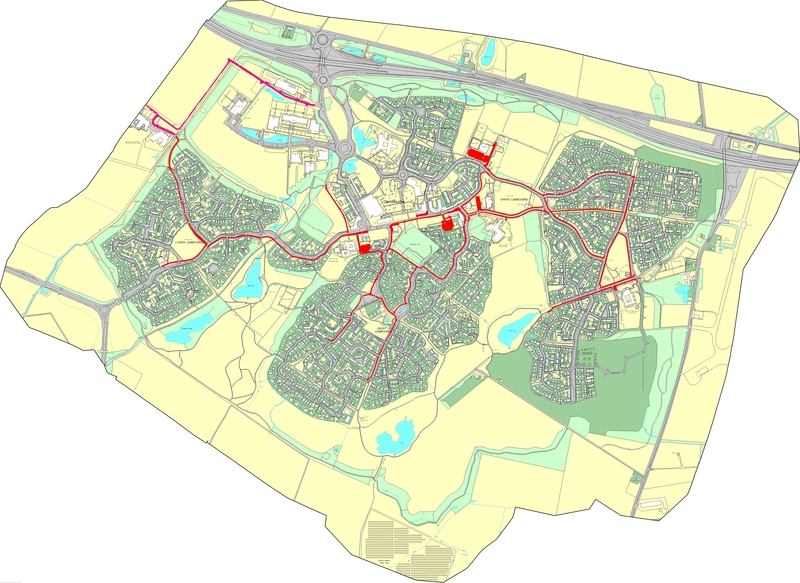 • Assist in developing the Business Park, bringing jobs and helping the sustainability of Cambourne. The Council will be notifying South Cambridgeshire District Council of the decision. MCA Developments Ltd would like to give advance notice of extensive roadworks that will be carried out in Cambourne to completely resurface the ‘spine’ roads of Back Lane, Sterling Way, Lancaster Gate & Mosquito Road. There will also be more limited resurfacing in Sackville Way, De La Warr Way, High Street, New Hall Lane, Brace Dein, Eastgate and Osier Way, as well as many areas of work on footway and cycleway. This work is being carried out to bring the highways up to a standard that should in due course see them adopted by Cambridgeshire County Council. The work is anticipated to take 38 weeks, commencing 11th March 2019, and will work its way along the road network in a rolling program. Updates may be made as required, on the Cambourne Parish Council website. Cambourne Parish Council carries out Winter Gritting under the County Council voluntary winter gritting scheme and can only go out to grit when permitted to do so and we rely on the County Council to supply the grit to distribute around the village. The routes have to be agreed by the County Council before we can commence gritting. The scheme covers footpaths NOT roads, although we have had permission to do the unadopted Sheepfold Lane to Cambourne Village College and Hardwick & Cambourne Primary School. Snow and ice is obviously a concern for all our residents and visitors. In particular children getting to and from school, so our intention is to have a pratical approach during school term times. We plan to spread grit to the agreed footpaths marked in red on the map. The grit will be spread either early morning before the school run or late evening after rush hour. Map attached shows the footpaths agreed to be gritted, and Sheepfold Lane. As displayed at the public exhibition at the Hub on February 15. If you are interested in becoming a Parish Councillor, please inform the Parish Clerk by 12pm, Wednesday 30th January. Co-Option will be held Tuesday 5th February at the Parish Council meeting. 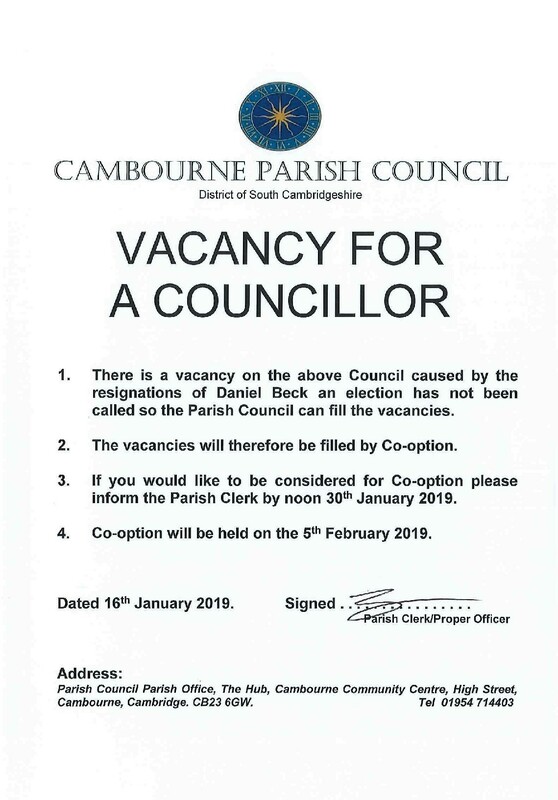 You can email clerk@cambourneparishcouncil.gov.uk or phone the office on 01954 714403. Please complete this very short survey, to help CBRR gauge if residents are keen to have a railway station in Cambourne.